LepideAuditor Suite is a centralized platform from which IT administrators can audit five different entities – Active Directory, Exchange Server, Group Policy Objects, SQL Server, and SharePoint. This application helps users enforce organizational security compliances and meet regulatory compliances like PCI, HIPAA, and GLBA. The primary function of LepideAuditor Suite is change auditing. It offers Who, When, Where, and What details of every change in an easy-to-understand format. This app provides more than 270 built-in reports that tell everything about the changes that were done by different users on various objects at different times. You can instantly generate the reports, or can schedule them to be generated at specified times. LepideAuditor Suite offers a free trial for a limited period after which you can buy the full license. Real-time Concept: With real-time log collection, the software is capable of performing real-time change configuration auditing. The software sends real-time alerts through email to the intended recipients and notifications to LepideAuditor App. Object Restoration: The software captures backup snapshots that save the state of Active Directory and Group Policy Objects periodically. These backup snapshots can be used later on to restore the state of these objects. Administrator can also restore the objects from tombstone state. In-depth Reporting: There are more than 270 predefined audit reports with scheduling, filtration, customization and other auditing functions. Moreover, the software shows more than 90 graphs on the top trending configuration changes. Health Monitoring: LepideAuditor Suite monitors the health of Active Directory, Exchange Server, and SQL Server. Any suspicious change in the server availability, resource consumption, or system services status is instantly notified to the recipients. What Problems Will LepideAuditor Suite Solve? The IT Auditor has to arrive on Monday. S/he will audit the server components to check the user actions, trails of configuration changes, and security loopholes. The Auditor will also track the user activities going on in the environment. The detailed reports of different categories are also required. Features: LepideAuditor Suite performs the real-time auditing and stores the change audit logs for long-term usage in its database. The predefined audit reports can be customized, filtered, and grouped by. While creating a testing environment, two important user accounts get deleted by the Administrator mistakenly. They are now spending a complete day in looking for the tombstone state of these objects. Features: LepideAuditor Suite creates the backup snapshots to save the state of Active Directory and Group Policy Objects in every 6 to 48 hours as per the selected schedule. The deleted and modified objects can be restored from these snapshots. Moreover, the software lets the administrator restore the deleted objects from the tombstone state. The crucial services of SQL Server were stopped. As a result, SharePoint and other dependent server components stopped working. There was no system to notify the administrator instantly about this technical glitch. Features: LepideAuditor Suite monitors the health of SQL Server, Active Directory, and Exchange. Any crucial changes influencing their health such as stopping of services or server unavailability are notified in real-time to the intended recipients through email in their inbox and notifications in LepideAuditor App. Companies have unique needs and requirements and no software solution can be perfect in such a scenario. It is pointless to try to find an ideal off-the-shelf software app that meets all your business needs. The intelligent thing to do would be to modify the application for your specific wants, staff member skill levels, budget, and other factors. For these reasons, do not hasten and invest in well-publicized leading applications. Though these may be widely used, they may not be the best fit for your particular needs. Do your groundwork, check out each short-listed system in detail, read a few LepideAuditor Suite reviews, speak to the maker for explanations, and finally settle for the application that provides what you want. 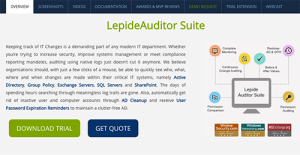 How Much Does LepideAuditor Suite Cost? We realize that when you make a decision to buy Project Management Software it’s important not only to see how experts evaluate it in their reviews, but also to find out if the real people and companies that buy it are actually satisfied with the product. That’s why we’ve created our behavior-based Customer Satisfaction Algorithm™ that gathers customer reviews, comments and LepideAuditor Suite reviews across a wide range of social media sites. The data is then presented in an easy to digest form showing how many people had positive and negative experience with LepideAuditor Suite. With that information at hand you should be equipped to make an informed buying decision that you won’t regret. What are LepideAuditor Suite pricing details? What integrations are available for LepideAuditor Suite? If you need more information about LepideAuditor Suite or you simply have a question let us know what you need and we’ll forward your request directly to the vendor.